First Novels Club: Hunger Games Cast: Donald Sutherland is President Snow! Oh my gosh, he makes a perfect President Snow!!! ^_^ I pictured Cinna and being a white blonde, super skinny guy. Not Lenny, but hey, I think it'll work! I always pictured Cinna as asian, but Lenny might work. 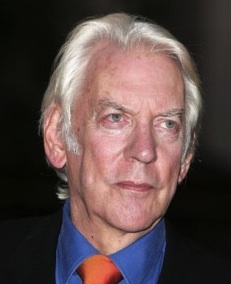 I think Donald Sutherland will do an awesome job. Sutherland doesn't strike me as nearly smarmy enough for Snow, but he definitely can be sinister enough. Should be a great performance. Oh, wow! That's fantastic! I love Donald Sutherland anyway and I know he can really do justice to the part. Did NOT picture Lenny Kravitz as Cinna at all. Not a bit. But that doesn't mean he can't bring something unique to the role. Man, I really really really hope they don't mess this up. This is going to be one of the most-anticipated movies ever!